How did you connect with CCAI? I really wanted to work for the adoption agency that I was adopted through, but when I started doing research, I found out they had gone out of business. I was really upset, so I asked my adopted friend’s mom what I should do. She told me CCAI was a really good agency. I wrote a letter to their Director of Adoptions, who is a certified social worker. I felt a connection to her because that’s what I’m going to school for. I told her my story and asked if CCAI offered any internships. She wrote me back and told me that I had the job. I was abandoned as a baby and raised in a foster home. 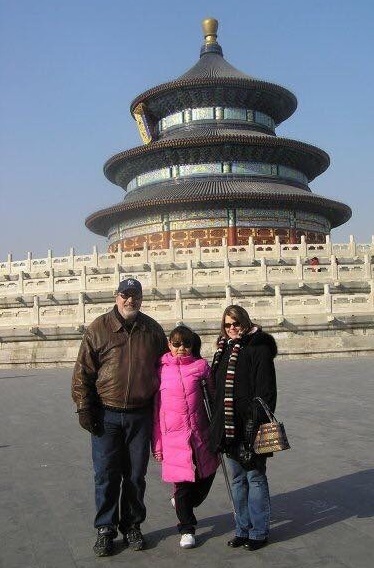 Where I’m from, and in the more rural parts of China, I personally think that a lot of foster parents just foster for the money and don’t really care about the kids. I was abused. When I was 11, I went to live in the orphanage and was so happy. I made friends there and began to get comfortable. It was the most stable environment I had known, especially because so few adoptions of older kids like me were going through. In attempt to find more of us homes, the orphanage took my peers and I to a CCCWA (the government agency that oversees adoption in China) camp for older kids. They invited American social workers to come get pictures and video to share with prospective parents. Each child prepared a song or poem to perform and it was recorded. As I was up on stage, I began to cry in the middle of my performance. The pressure was so great because I knew my only shot at finding a family very well might depend on my performance and I feared that no one would want me. A few months after I turned 13, I started to panic because I knew I was going to age out if they couldn’t find a family for me soon. I was worried, so I wrote another letter. This time I wrote to someone at the CCCWA. I told her to hurry up and find me a family and begged her to do it soon. I also told her that China held no future for me at all. She wrote back and told me she would try, but offered no guarantees. I am so thankful for the reality that I wasn’t aware of at that time; that there were people out there who wanted me. My parents saw the video of that performance and said God spoke to them and told them that I was meant to be theirs. They filed their paperwork as soon as possible and the orphanage told me that I was going to be adopted. Yes and no. I knew that this would be my only chance at having a decent life and felt like I should be grateful because my wish for a family finally came true, but I had a lot of anxiety about leaving the orphanage I’d been in for the past two years, especially because all my friends were there. That really was my happiest place from my childhood. How was the transition to the States? HARD. My parents were nice, but all I knew how to say in English when I was first adopted was yes and no and a heavily-accented thank you. I didn’t know how to communicate my emotions and needs and honestly, I didn’t even know how to express myself in Chinese either. I became really rebellious, which was my childhood go-to coping mechanism. My parents were patient with me, even though it was frustrating on both of our ends not knowing how to communicate. We had a lot of arguments and attachment issues, but we survived after years of struggling. I thank God every day for their commitment to provide; I would never be where I am today without them. I now look back and think I made things really difficult for them, but I’m so thankful they were understanding and loved me anyway. Did you go to public school? Yes, and that was really difficult. They didn’t even have an ESL (English Second Language) assistant there when I first started so I just sat in classes and didn’t have a clue what was going on around me. When did it start to click? The second half of my sophomore year. I finally began to understand entire conversations and that’s when I really started trying in school. I started making friends and things got better from there. Where do you go to school now? I’m a junior at the University of Missouri. What was most rewarding about your internship with CCAI? Helping other kids who are in the same boat that I once was in. I was able to speak with many older children that were either adopted recently or in the hosting program this summer. Their families didn’t know how to help them and called our Post Adoption department and I was able to speak Chinese to the kids and share my story and hear theirs. Sometimes it’s heartbreaking, but it was so rewarding. For the hosting kids, a lot of times they just listened, but their parents said it really helped. For the recent adoptees, it was my privilege to be able to hear their stories and share my stories with them—to let them know this is a long adjusting process and that they are never alone in this. I want to work for an adoption agency–hopefully CCAI–and be a social work mediator between the US and China. Hello CCAI families! Here is your weekly dose of cute – please meet Shi! He is 9 years old. Shi had the opportunity to participate in our Winter Hosting Program 2015. He loved living with his host siblings, and would really love to have his own siblings some day! Please share his story to help this sweet boy find his family! “Shi is a typical boy – he loves to play basketball and with matchbox cars. The only thing he dislikes is arts and crafts. Currently, he is running around the house with a flashlight hunting for monsters under our beds. He doesn’t let his skull abnormality keep him from participating in games. As the Nerf darts were flying around the house, he went and put on his helmet before I told him to. He is not a picky eater. He will choose healthy foods over sweets. Our dentist praised his teeth brushing habits, and Shi had no cavities. He loves to take bedtime baths. He sleeps well and dresses himself. Shi is a sponge! He was able to pick up English so quickly! We are a family of 12 and within one week the clever boy knows all our English names. He is a sweet boy with a good temperament and he really loves hugs! He is sensitive boy with just a pinch of naughtiness added. He is always curious and up for any challenge. He likes to run with the older boys and when they are tired of playing he is content to play with our 6 year old daughter. Shi is so bright! He is able to look at directions and build complicated Lego figures without any help! Shi’s host family is willing to talk with families that are seriously interested in adopting him! Please ask the Waiting Child Department for more information. Shi is a Special Focus child, meaning he can be matched to a family either with or without a dossier in China and may also be accepted along with another child! He is diagnosed with Head and chest malformation, poor development of right clavicle, and missing parietal bone. 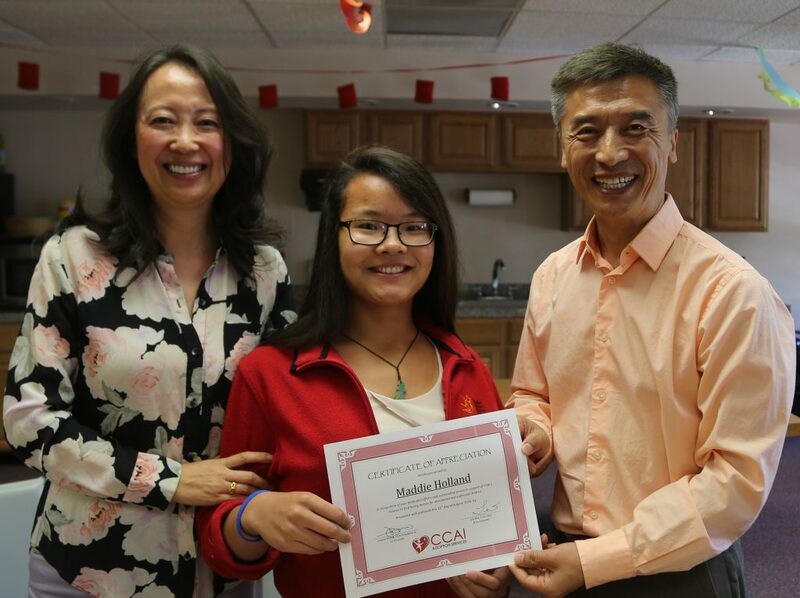 Please call 303-850-9998 or email waitingchild@ccaifamily.org for more information about Shi! Visit http://ccaifamily.org/WaitingChild/Waiting-Child-Profile.aspx to see more children waiting for their forever families. It’s time for another Too Cute Tuesday! Meet Kun (you might also recognize her as Quinn from Journey of Hope!) This silly, fun-loving 10-year-old girl always has a smile on her face. Please help us share her story so that she can find her forever family! Kun likes to sing and dance, and she sure likes to talk too! She has learned to express her needs and takes the initiative to say “hi” to visitors and play games with the younger children. Quinn also comforts other kids when they are sad by sharing her own toys. She can help nannies with chores and loves to help others. “Kun is a cheerful, cuddly girl who loves to giggle and be silly and loves attention. She is definitely a girly girl and likes having her hair brushed (and to brush others) nailpolish and chapstick, and the prettier the dress the better. She loves playing with shape puzzles, building toys (like legos and magnetic shapes) and especially play-doh. She LOVES to sing and could never get enough of swing dancing with one of us in the living room. She enjoys chores and took it on herself to do things like sweep, wash windows, break down boxes, and fold clothes – she has an amazing work ethic. She has good self care skills – can bathe (though I stayed with her at bathtime) and dress herself and can go to the bathroom on her own. Please help us find Kun’s forever family! **PLEASE NOTE: Huang is the child in the orange t-shirt in the video. The other child is not available for adoption. Huang is a sweet 12-year-old boy who enjoys painting, coloring, writing, running, soccer, and jump rope. He was a part of our Summer 2015 hosting program, and would love to have a family to call his own! Unfortunately, CCAI does not have much time left with his file. In about 2 weeks, since he has not yet found a family, we will have to return his file to China. Huang turns 13 this month – giving him only 1 year before he “ages out” of his eligibility for international adoption. Please help Huang find his family! Huang has post operative cleft lip and palate and ptosis. He says he has a few special friends and likes to play blocks with them. His favorite toys are yo yo’s and remote control cars. Huang is presently in 2nd grade. His favorite subjects are gym and art, and his favorite color is blue. He thinks he’d like to be a policeman when he grows up, and the only thing he’s afraid of is elephants! His host family says this about him: “He has a gentle spirit and is very helpful around the house. He very smart and learns quickly. His favorite activities include swimming in a lake, tubing, and watching fireworks for the fourth of July. He has learned how to ride a bike and loves it! He enjoys playing outside a lot, climbing trees and digging in the sand. He liked the local library activity where he could create things. He doesn’t enjoy a lot of people or riding in the car very long. He likes to know what the next activities and meals are. Huang was very fun to have as a part of our family this summer. He was gentle with our four-year-old son, and knew well how to care for him and negotiate sharing/trading toys with him, although (as a typical twelve-year-old) he would get frustrated with the copying and sometimes needed to play with peers. He loved hugs and snuggles from our son, but had a harder time with physical affection from adults. Tian is a curious and fun loving 10-year-old boy. He was a part of our Summer 2015 hosting program, and would love to have a family of his own! CCAI does not have much time left with his file. In just about 3 weeks, since he has yet to find his forever family, his file will have to be returned to the China. Please help us share Tian’s story so that he can find his family! Tian is a very considerate boy. He has some deafness on one side, so you need to speak louder for him to be able to hear your instructions from a distance. He is fairly independent for his age with strong self-care abilities. He likes playing with wooden blocks, playingping pong, putting together jigsaw puzzles, looking at picture books, and singing and dancing. His favorite color is red, and he likes to eat fruit and meat (especially ribs!). Turtles are his favorite animal. His host mother says this about Tian: “Tian may appear shy at first, but don’t let that fool you! He warms up quickly, and becomes an extroverted and enthusiastic boy. Words to describe his personality include: curious, active, conversational, and fun loving. He has many questions about how things work and life in America.He enjoys ping pong, tennis, drawing, painting, and especially building Legos. Although he has significant hearing loss, he enjoys music and singing. Also, he seems mechanically inclined with great interest in put things together, taking them apart, and anything electronic. He likes petting and holding our two cats. Tian is also used to siblings and enjoys spending time with them. As far as food, he loves noodles, meatballs, eggs, white rice, pizza, hamburgers, French fries etc. He is willing to try American foods, but doesn’t like cheese (except for Mac and Cheese!). He has a very healthy appetite and is generally willing to eat cooked veggies and even sliced cucumbers. Like any kid, he adores candy, gum, and ice cream (strawberry is his favorite).” Please help Tian find the family he deserves!